The Community of Lake Las Vegas supports local business owners and has a wide array of professional services available for residents and visitors alike. The following professionals are located in or near to Lake Las Vegas and are available to serve your business or personal needs. The staff at OwnLakeLasVegas.com recommends only those product and service providers with whom they have specifically done business. It is important to us to be able to recommend trustworthy area professionals. We are always looking to add to this list. If you know of a local company or provider, email company contact information to Service@OwnLakeLasVegas.com and your request will begin the consideration process. 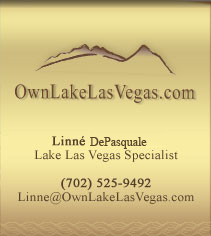 You may also post a bulletin on the OwnLakeLasVegas.com Community Bulletin Board for all residents to see. Lake Las Vegas residents, thank you for your support of local businesses and encourage your patronage to those provided below. Real Estate Services are provided by Linne Karstensson. Linne has worked for many Fortune 500 Real Estate companies and is a lifetime resident of the Las Vegas valley. Linne can be reached directly on her mobile phone listed below. Mortgage Services are provided through Elysien Private Wealth. Elysien Private Wealth is a Registered Investment Advisor in the state of Nevada and has various outstanding programs for both your residential & commercial needs. You may contact any Elysien Private Wealth lending planner to schedule a no-obligation consultation. For all of your financial plannning needs, from estate and retirment planning, to insurance and portfolio management, contact Tony DePasquale with Elysien Private Wealth. Tony DePasquale has consulted for many Fortune 500 firms and was named by In Business Las Vegas as a "Who's Who" In Financial Planning & Banking. Tony can be reached for appointments at the number below. For all of your home appraisal needs, please contact Brian Edwards with Appraisal Associates of Nevada. Brian is the owner of Appraisal Associates and is well-experienced specifically in the Lake Las Vegas area. His company guarantees ethical, high-quality, professional servce, with fair pricing. Call Brian to order your appraisal. For professional, ethical service, and a vast experience in the tax planning world, please feel free to contact Bob Greenspan. Bob has more than 25 years of experience as a CPA, and is a licensed CPA in the state of Nevada. Contact Bob directly to schedule a consultation. Exclamations Salon is a quaint, upscale hair, nail, & massage salon located in Henderson. Owner, Jacki Hoyt, was the long-time General Manager of the Neiman Marcus Beauty Salon at the Fashion Show Mall prior to opening Exclamations in order to fill a need for high-quality hair, nail, & massage services located off the Strip. Exclamations is currently accepting new clients on a limited basis. Call to schedule an appointment. Quiltique is the area's foremost authority on recreational quilting and fabric crafting. With skilled experts and hosted classes, Quiltique carries the supplies and the information for you to be able to flex your crafting muscles. Quiltique is also a certified Bernina dealer, offering the very best sewing, quilting, & embroidery machines. More Community Resource Recommendations Coming Soon! other articles for us to add.